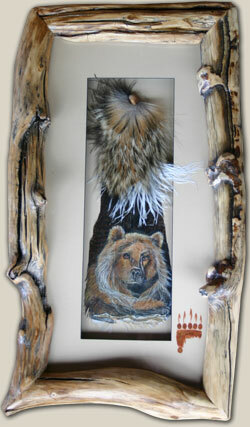 Hand Painted Feathers - "Majestic Bear"
This Majestic Bear stares straight forward, patiently watching and waiting for a sign. Available Sizes: 10" X 20"
All Peg Fennimore Feather Paintings are created using acrylic on turkey or peacock feathers with a variety of legally and respectfully acquired feathers, leather and fur. No two are ever alike and every piece is numbered. This double-feather piece is only available in 10 x 20. 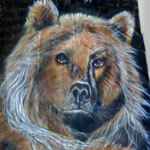 To get your Peg Fennimore art, please check our for sale page or contact us about a custom commission.